On arrival at Amritsar Airport/Railway station, our representative will welcome you and transfer to the hotel for check-in. Overnight stay at the hotel. This prominent city in Punjab is the home to the holiest shrine of Sikhs called Harmandir Sahib, which is also referred as the Golden Temple. The travelers visiting Amritsar can also visit other popular attractions like Wagah Border and Jallianwala Bagh (site of the 1919 Amritsar Massacre). After breakfast, go to visit the holiest shrine of Sikh Religion – Golden Temple. On arrival, spend some time to connect with your inner self or God. Once through with the visit go to visit Jallianwala Bagh, the site of massacre during the Indian freedom struggle. Later, go to visit Wagah Border to see the grand border closing ceremony, which is also referred as the “Beating the Retreat Ceremony”. The ceremony commences just before the sunset and takes around 45 minutes to complete that includes flag lowering ceremony, marching and roared military commands between the Indian Border Security Force and the Pakistani Sutlej Rangers. This vibrant ceremony attracts countless tourists every day. Later, return to the hotel. Overnight stay at the hotel. After breakfast, check out from the hotel and transfer to the airport/railway station to board a flight/train for an onward destination. Situated in the Indian state of Punjab, Amritsar commands great religious and historical importance. Enjoying a location close to the international border, the city is home to several religious and historical sites that inspire travelers from India and across the globe to explore it comprehensively. Amritsar is home to several tourist attractions, but it is Golden Temple, the city is best known for. The most sacred site for the Sikh devotees, Golden Temple is a place of religious and historical significance. Owing to its popularity a large number of vacationers and devotees seeks Golden Temple tour packages in order to visit this city which is full of places with historical and religious importance. At BookOtrip, we facilitate travelers planning a trip to Amritsar by offering them affordable travel solutions. With several decades of experience helping travelers with their trip to this holy city, we have got an inside out knowledge of this destination and services available there. We leverage our experiences and connections to serve our customers better. 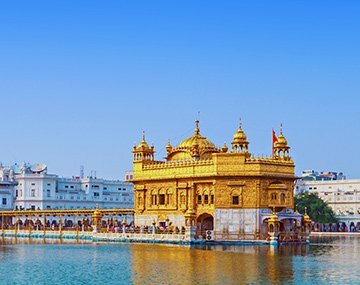 Our Amritsar tour package is designed in a way to enable travelers to explore the popular city attractions in a couple of days. Book your vacation on your own or call our trip experts for assistance. I went to Golden Temple and had the most amazing experience! Bookotrip provided me an excellent services, the travel agent did an awesome job booking everything I wanted to do.I told them exactly what I wanted to visit/do/see.They took care of everything else.Thank You Bookotrip !! !